Last night, I headed out to knitting group as usual where we were having a spinning workshop. I took along my ongoing spindle project, the merino I started spinning back in January which has been a bit neglected since the arrival of the borrowed wheel (which is still great, I just need more spare time). I was wielding the camera, so no pictures to prove I know how to use a spindle, but I was relieved to see that my hands seem to know what they're doing now. In fact, if anything, I'd say my drafting has improved dramatically in the past couple of weeks, possibly due to successful drafting at the wheel. This weekend is also an anniversary of sorts, with the Re-enactors Market or TORM coming around and marking my first attempts to use a spindle, one year ago! 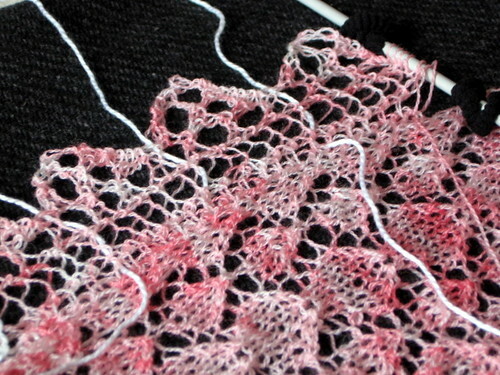 At home, I'm still working on my lace project. I finally finished the centre panel, comprising the main part of the shawl and I happily started the border, sensing the end was in sight. Sadly, I'd underestimated how difficult and fiddly it is to knit a border onto a shawl in cobweb weight yarn on fat needles. The pattern isn't difficult, it's just a few stitches but getting the length of the shawl untwisted, preventing the still attached circulars from tangling and stopping the cat from grabbing the whole mess is proving tricky. 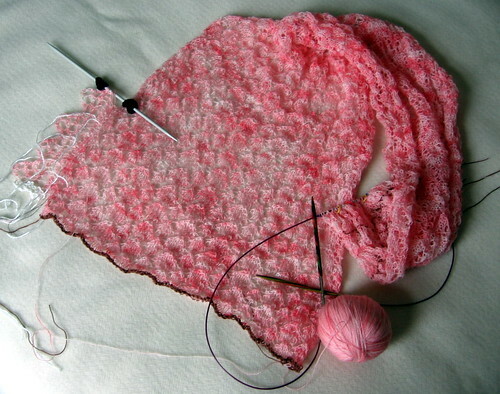 No lifelines, far too many yarn overs and cobweb yarn made the stitches hard to see... I couldn't even be sure how many stitches had accidentally ripped themselves out, so there was no choice but to frog the whole thing and start again. The lessons I learnt from this were to continue using lifelines in the border, no matter how silly it might seem. And to implement 'stitch stops' in the form of a couple of hair bands on the DPNs to discourage the live stitches from leaping of the needle while the project is sleeping on a shelf. A close up of the border pattern as it stands with a little contrast... Here you can clearly see lifelines and hair elastics attached to the DPN. I'm currently standing at eleven repeats of the border down one side, a week and a half after starting knitting. There are four sides to this shawl, two with twenty eight repeats and two with twelve repeats, plus another six at each of the four corners. Somehow, I don't think this is going to be done any time soon! Looks really pretty though.. tell me you are making this for you and not another present though!! Ps I learnt something today I'd never heard of lifelines before.